Comments Off on KICK OFF TO ADVISING!! 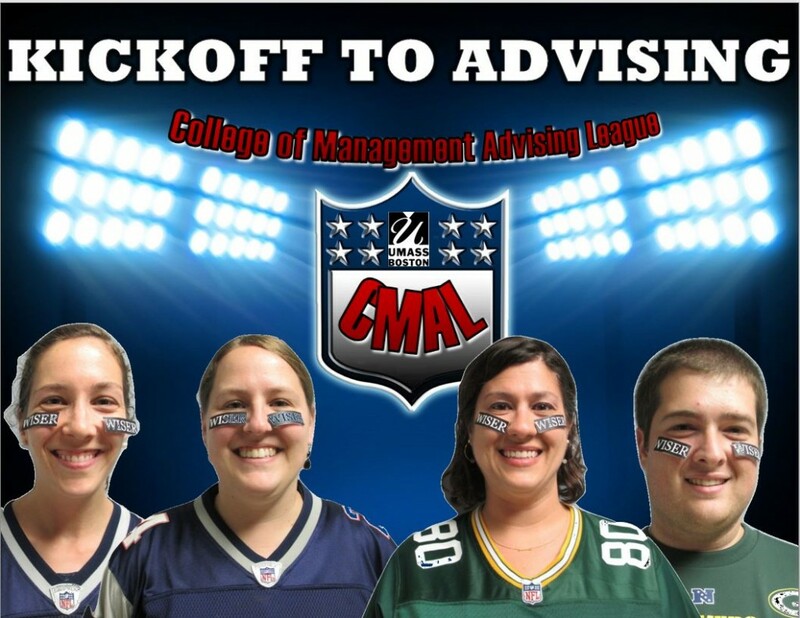 We’re not the JV Advising Team, Welcome to the CMAL! Meet with an advisor in the College of Management 10/2—10/6 to get a start on planning for spring 2018 registration AND take home some CM swag! Our KICK OFF gift to you is all day drop-in advising on 10/2. from 9:00am to 11:30am and 1:00pm to 4:30pm. Please check visit the Drop-In Advising blog page for more information about the Drop-In Advising schedule, and the link to make an appointment with your assigned advisor. CM Students with less than 60 credits should plan to meet with their advisor in the University Advising Center about Spring 2018 Registration! Today, September 26th the afternoon drop-ins from 3:00 – 5:00pm are cancelled as advisors are assisting with the Business, Accounting and Finance Career Fair. Regular Drop-ins are available for the rest of the week and you can always make an appointment with your assigned advisor. Graduation Quick Checks next week! Please see below for next week’s MAP workshops. 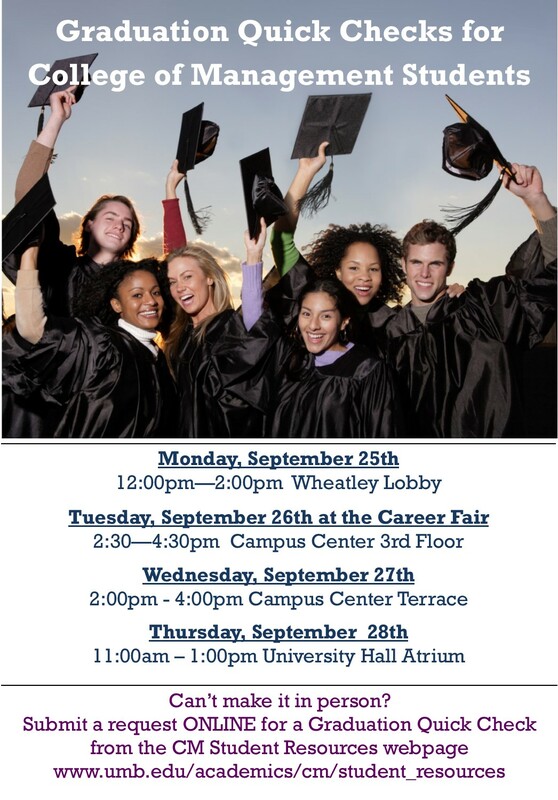 Make sure you come by the Business, Accounting, & Finance Career Expo next Tuesday 9/26/17 from 3pm-6pm on the third floor of the Campus Center. You can earn two miles for engaging with employers at the expo- just be sure to check out with a CM staff member before you leave. We will be by the third floor elevators. Comments Off on College of Management Graduate Program Office is Hiring! 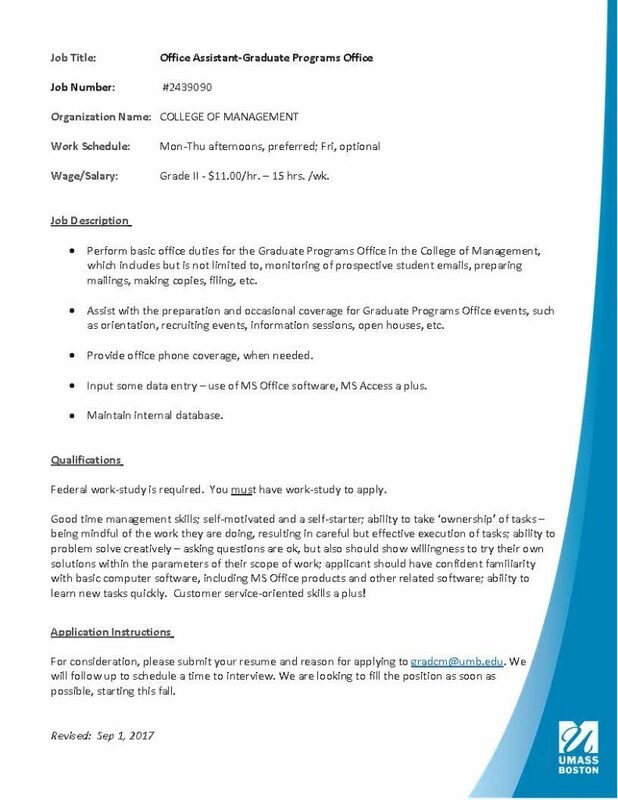 College of Management Graduate Program Office is Hiring! Work Study is required for this campus position – see below for more details or contact gradcm@umb.edu. Did you know the College of Management offers tutoring for many of our core classes? We have tutors available for the following courses: AF 210, AF 211, AF 301, BC 230, BC 290, MGT 303, 330 & 331 (writing only), MSIS 110, MSIS 111L, MSIS 212, and MSIS 301. Tutoring for CM Courses is now available for the Fall 2017 semester. Please visit the CM Tutoring Center page on our Blog for more information http://blogs.umb.edu/upo/cm-staff-pages/cm-tutoring-center/. Tuesday, September 12 was the last day to be able to add a course for the semester, or to be able to drop a course without a “W”. If Wiser shows that you are still on a wait list for the fall semester, you can either drop yourself from that wait list, or not – it actually doesn’t matter at this time since Wiser will no longer be adding students to courses from the wait list through it’s automated process. If you are still on a waitlist, you should also stop attending that course (if you haven’t stopped already). The next chance to register for classes that you might not have gotten into this semester is on Monday, November 6 for Spring 2018 semester courses. Best wishes for a great fall semester! To earn a MAP mile for Convocation, you are required to sign in at CM table in Ballroom C.